1 A None No Power Seat 1 A is a Business Class Bulkhead seat whose close proximity to the lavatory and galley may be bothersome. There may be no floor storage for this seat during take-off and landing. 1 C None No Power Seat 1 C is a Business Class Bulkhead seat whose close proximity to the lavatory and galley may be bothersome. There may be no floor storage for this seat during take-off and landing. 1 D None No Power Seat 1 D is a Business Class Bulkhead seat whose close proximity to the lavatory and galley may be bothersome. There may be no floor storage for this seat during take-off and landing. 1 F None No Power Seat 1 F is a Business Class Bulkhead seat whose close proximity to the lavatory and galley may be bothersome. There may be no floor storage for this seat during take-off and landing. 12 A None No Power Seat 12 A is an Economy Class seat with limited recline due to the Exit Row behind. 12 C None No Power Seat 12 C is an Economy Class seat with limited recline due to the Exit Row behind. 12 D None No Power Seat 12 D is an Economy Class seat with limited recline due to the Exit Row behind. 12 E None No Power Seat 12 E is an Economy Class seat with limited recline due to the Exit Row behind. 12 F None No Power Seat 12 F is an Economy Class seat with limited recline due to the Exit Row behind. 13 A None No Power Seat 13 A is an Economy Class Exit Row seat with extra legroom. However, this seat has limited recline due to the Exit Row behind. There is no floor storage for this seat during take-off and landing. 13 C None No Power Seat 13 C is an Economy Class Exit Row seat with extra legroom. However, this seat has limited recline due to the Exit Row behind. There is no floor storage for this seat during take-off and landing. 13 D None No Power Seat 13 D is an Economy Class Exit Row seat with extra legroom. However, this seat has limited recline due to the Exit Row behind. There is no floor storage for this seat during take-off and landing. 13 E None No Power Seat 13 E is an Economy Class Exit Row seat with extra legroom. However, this seat has limited recline due to the Exit Row behind. There is no floor storage for this seat during take-off and landing. 13 F None No Power Seat 13 F is an Economy Class Exit Row seat with extra legroom. However, this seat has limited recline due to the Exit Row behind. There is no floor storage for this seat during take-off and landing. 14 A None No Power Seat 14 A is an Economy Class Exit Row seat with extra legroom. There is no floor storage for this seat during take-off and landing. 14 C None No Power Seat 14 C is an Economy Class Exit Row seat with extra legroom. There is no floor storage for this seat during take-off and landing. 14 D None No Power Seat 14 D is an Economy Class Exit Row seat with extra legroom. There is no floor storage for this seat during take-off and landing. 14 E None No Power Seat 14 E is an Economy Class Exit Row seat with extra legroom. There is no floor storage for this seat during take-off and landing. 14 F None No Power Seat 14 F is an Economy Class Exit Row seat with extra legroom. There is no floor storage for this seat during take-off and landing. 22 A None No Power Seat 22 A is an Economy Class seat in the last row of the plane that may have limited recline. The close proximity to the lavatory and galley may be bothersome. 22 C None No Power Seat 22 C is an Economy Class seat in the last row of the plane that may have limited recline. The close proximity to the lavatory and galley may be bothersome. 22 D None No Power Seat 22 D is an Economy Class seat whose close proximity to the lavatory and galley may be bothersome. 22 E None No Power Seat 22 E is an Economy Class seat whose close proximity to the lavatory and galley may be bothersome. 22 F None No Power Seat 22 F is an Economy Class seat whose close proximity to the lavatory and galley may be bothersome. 23 D None No Power Seat 23 D is an Economy Class seat in the last row of the plane that may have limited recline. The close proximity to the lavatory and galley may be bothersome. 23 E None No Power Seat 23 E is an Economy Class seat in the last row of the plane that may have limited recline. The close proximity to the lavatory and galley may be bothersome. 23 F None No Power Seat 23 F is an Economy Class seat in the last row of the plane that may have limited recline. The close proximity to the lavatory and galley may be bothersome. This seat is also missing a window. 4 A None No Power Seat 4 A is an Economy Class Bulkhead seat with extra legroom. The tray table is in the armrest, making the armrest immovable and slightly reducing seat width. There is no floor storage for this seat during take-off and landing. 4 C None No Power Seat 4 C is an Economy Class Bulkhead seat with extra legroom. The tray table is in the armrest, making the armrest immovable and slightly reducing seat width. There is no floor storage for this seat during take-off and landing. 4 D None No Power Seat 4 D is an Economy Class Bulkhead seat with extra legroom however the proximity to the galley may be bothersome. The tray table is in the armrest, making the armrest immovable and slightly reducing seat width. There is no floor storage for this seat during take-off and landing. Other flyers may bump into this seat. 4 E None No Power Seat 4 E is an Economy Class Bulkhead seat with extra legroom. The tray table is in the armrest, making the armrest immovable and slightly reducing seat width. There is no floor storage for this seat during take-off and landing. 4 F None No Power Seat 4 F is an Economy Class Bulkhead seat with extra legroom. The tray table is in the armrest, making the armrest immovable and slightly reducing seat width. There is no floor storage for this seat during take-off and landing. 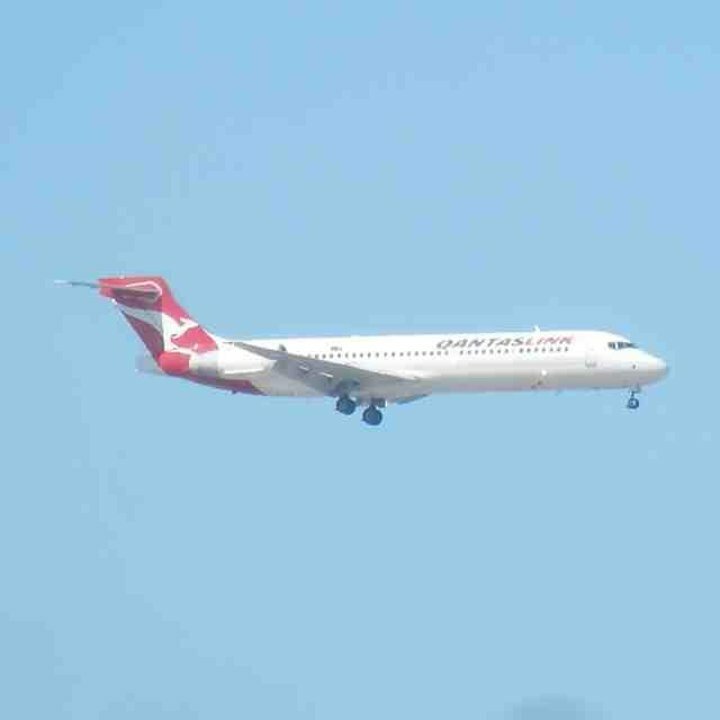 Qantas flies three versions of the Boeing 717-200. This version features 110 seats in a two-class configuration of Business and Economy. This aircraft cruises at 810km/h and has a range of 2408km. This aircraft is flown by Qantas' regional airline, QantasLink, and features a new Business Class product with premium entertainment and food service. Worth the few extra dollars to upgrade to this seat given how jammed the other seats in the main cabin are. Had this seat on a short BNE-SYD run and thankful it was short. Extra leg room notwithstanding the seat was like sitting on a bench. This seat has no recline. It also has no outside view as the window is completely blocked by the engine. Proximity to toilet is hard to ignore. Possibly the worst seat I have ever experienced. I was in Seat 2A from Sydney to Gold Coast, service was great, seat was ok, entertainment from the ipad was good (after all, you often don't get entertainment on domestic flights, goodbye virgin australia, hello Qantaslink! These seats have been recently refurbished in a lovely comfy leather which is much more pleasant than the shabby old fabric covers on many of the 737s. However, the seats are a bit more cramped with less width and far less legroom than most Qantas domestic business - woe betide anyone who has the person in front recline their seat. The biggest design flaw is in the tray tables - they don't fold in half, and they don't pull out far enough, which makes your eating/working space inflexible and crampy. Fine on a short hop, but if you're looking for extra personal space on a domestic leg, stick to the 737s instead of these 717s. Both windows in row 22 are blocked by engine cowling. Also, row 18 and beyond is extremely noisy due to rear mounted engines. I found this economy seat to be the most comfortable and roomy of all the various economy seats that Qantas use across their aircraft range. Much better that the bone crushing seats on their 737/800s. 23 DEF should not even be sold. There is no provision for cabin luggage as area is reserved for cabin crew. Leg room is really tight, no window, restricted aisle with constant bumping as staff use their equipment area opposite. Engine noise is horrific.